Ya puestos, le añadimos la letra a la canción para que podáis escuchar y leer a la vez (ya haremos algún ejercicio fill in the gaps). Voy a subir una foto directamente desde mi ordenador. 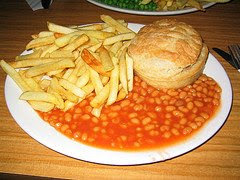 Typical British lunch. Healthy, uh! Find the names of some parts of this house. Click the photo and then scroll the mouse around it to learn some words. This year we are going to use this blog to make some additional activities to the regular classes. As you know, the aim is to improve listening and speaking so let's start listening to this well-known song by Alicia Keys while you fill in the accompanying gaps. Believe it or not, here comes September again! There are new challenges ahead, some of them exciting but... It's so good to stay away from high school for a while! Anyway, I hope to do a good job in my new responsibility (otherwise my teacher colleagues will kill me!). Dear teachers, as a new course starts let's sing together: GO GET'EM! Born in Madrid in 19?? (who cares? ); got an English major in English Philology at Complutense University, Madrid. Currently, I'm working as a Secondary teacher of English in a public high school in Madrid.